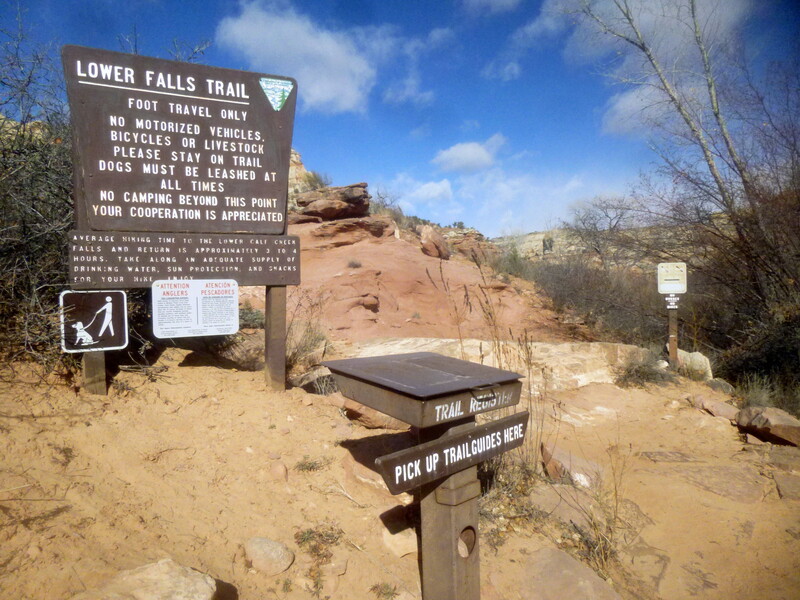 The Lower Falls trailhead is accessible from the Calf Creek Campground, located at the bottom of a windy descent on Highway 12 if coming from Boulder, or just before the climb out of Calf Creek Canyon if coming from Escalante or further west. There is a large parking lot at Calf Creek, though it quickly fills up in the summer. When I was here in December 2014, there was a $5 fee per vehicle (it is $15 to camp), and there were at least five other cars parked in the lot. 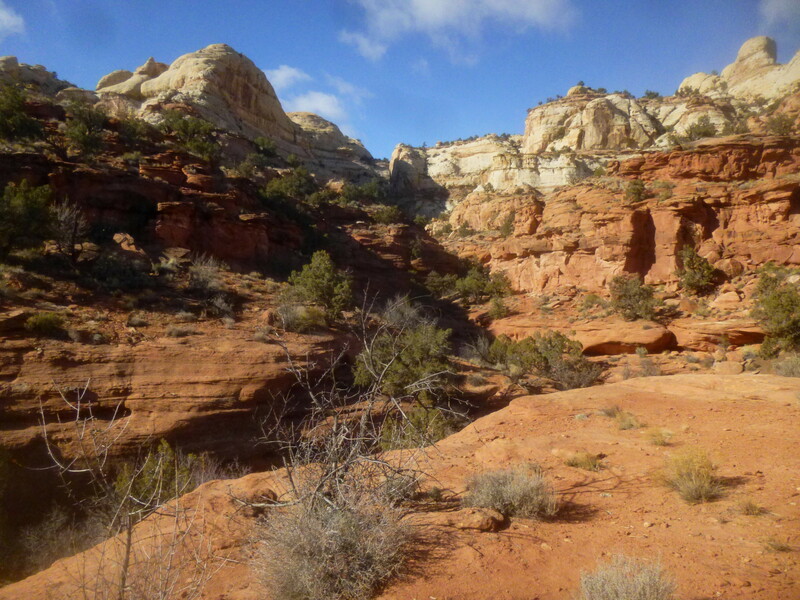 The trail immediately veers left amid the red-pink rock—a layer known as the Kayenta formation—then heads north and follows a short red-orange cliff face on your left. A couple minutes down the trail, the Kayenta has eroded into interesting shapes, including a handful of fragile arches (or soon-to-be-arches). The wide, sandy path then continues through patches of thick brush—the most colorful of which may be rubber rabbitbrush, boasting bright yellow flowers with long, light green stems. 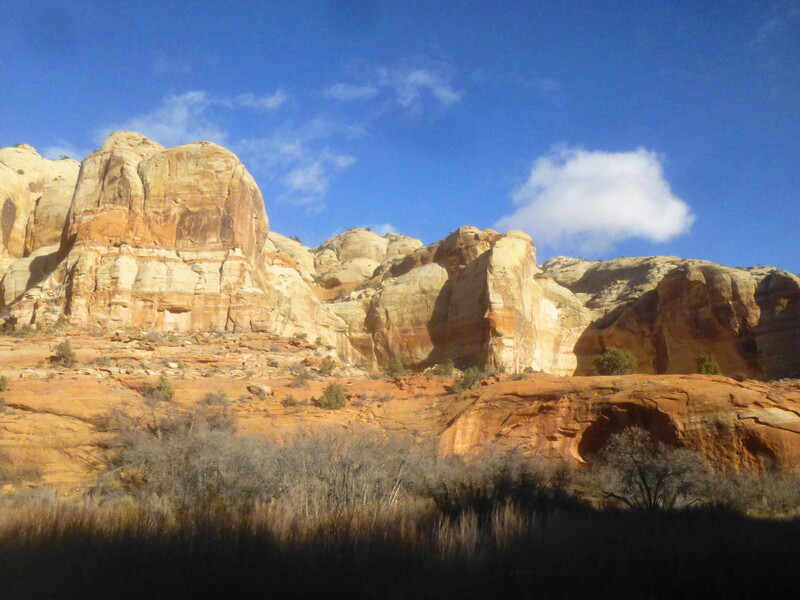 Calf Creek, though rarely visible due to the thick vegetation, can be heard gently flowing to your right. At about ¼ mile, the trail dips down into the first of a number of dry washes. While the path up until the wash is quite obvious, the exit is not: veer a bit to your left (up the wash) and climb the small reddish bank in order to find the trail, which becomes obvious again atop the shelf on the other side. From here, the route stays above the Calf Creek drainage on the left, sandwiched between a Kayenta cliff face and a 15-20 foot drop-off. Eventually the wide trail descends again to the alluvial plain below, littered with large Gambel oaks. It’s around here that interpretive sign #3 discusses the role of beavers in forming and maintaining these wetlands, teeming with biodiversity. 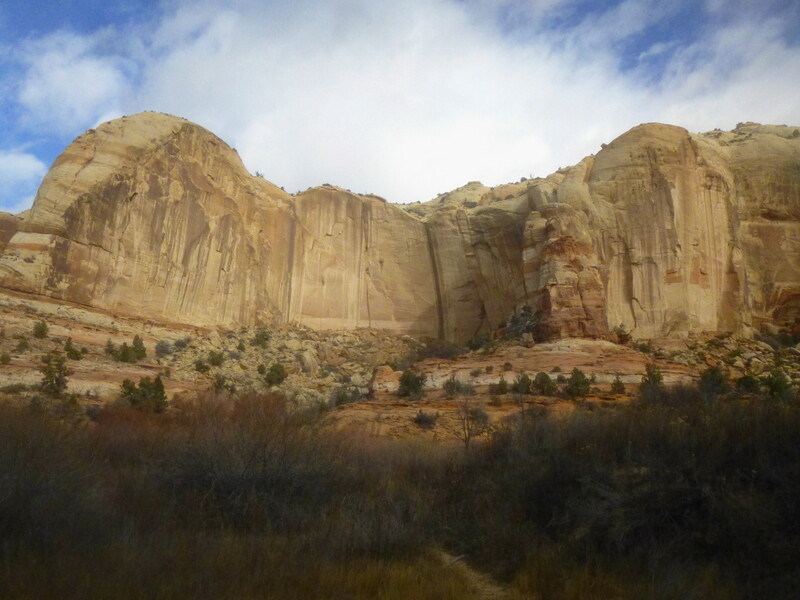 At about 1/2-2/3 mile, the trail crosses a second wash, a tempting side canyon leading up into the pearly white Navajo sandstone cliffs above. 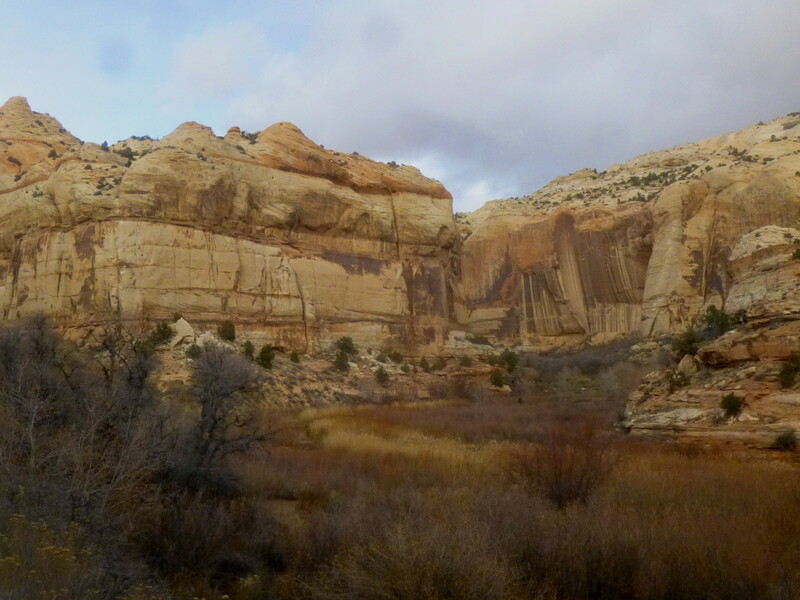 After climbing up and out of the wash, the sound of Calf Creek becomes crisp and clear: just before another ascent, the narrow stream comes into view on your right. At the top of the brief climb, there is a beaver pond, where water sits still for a moment before tumbling along downstream. Another 15 minutes’ walk brings one within clear view of an impressive promontory protruding into the canyon from the left side. 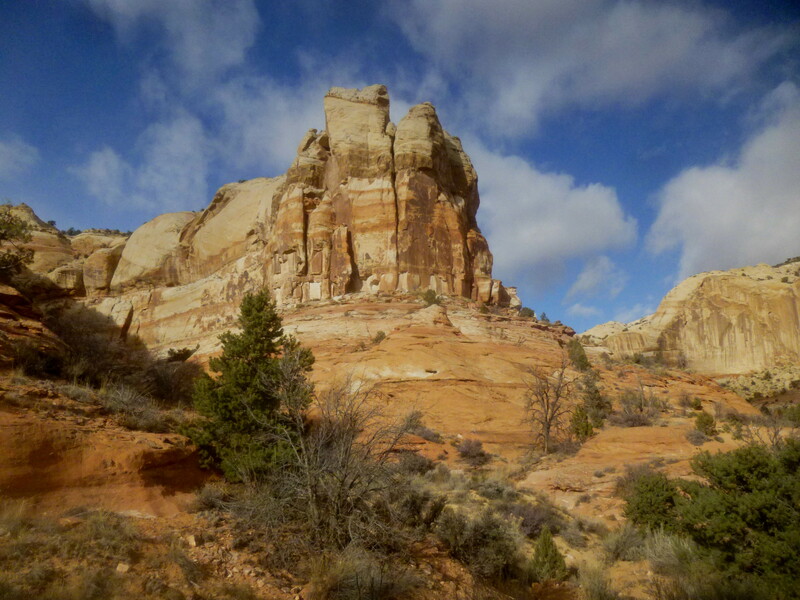 Around here, the Kayenta noticeably begins to fade; within the next half mile, it will be replaced almost entirely by the soaring cliffs of the Navajo sandstone, mostly a tan color, though often bleached with red, orange, black, or brown. Post #5 points out a couple old granaries built into the walls by the Fremont Indians (700-1300 AD) to store food and supplies. Alas, they are difficult to spot; another granary farther up the trail on the left is easier to recognize from a distance. With the promontory high above, the trail descends into a third dry wash. Five minutes’ walk leads to signpost #8. 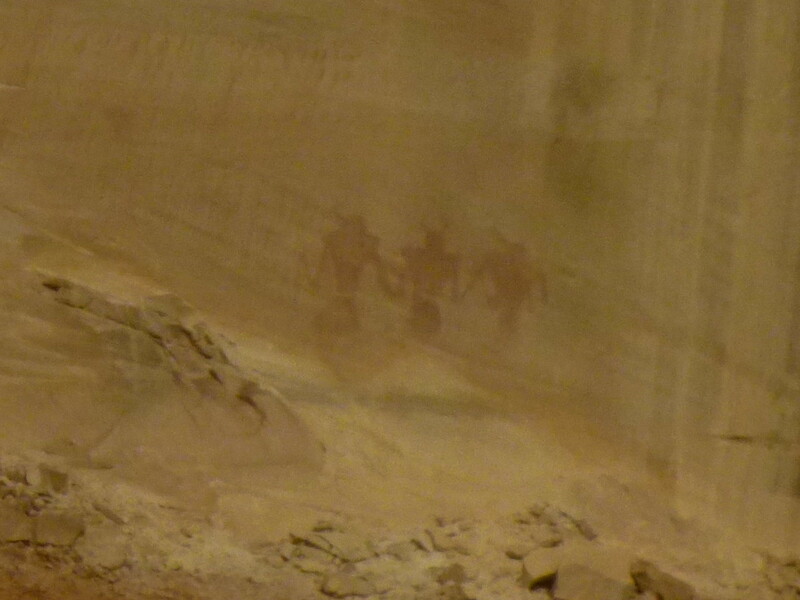 From here, scouring the cliffs on the opposite side of the canyon, you should be able to spot three anthropomorphic pictographs near the bottom of the sandstone cliff walls. (Note: There is a large fin separating the canyon wall into two discernable “sections”—the pictographs can be found in the section to the left.) These figures, like the granaries, were painted by the natives known to anthropologists as the “Fremont” people, proclaimed to be the ancestors of today’s Navajo, Hopi, Ute, Paiute, and others. 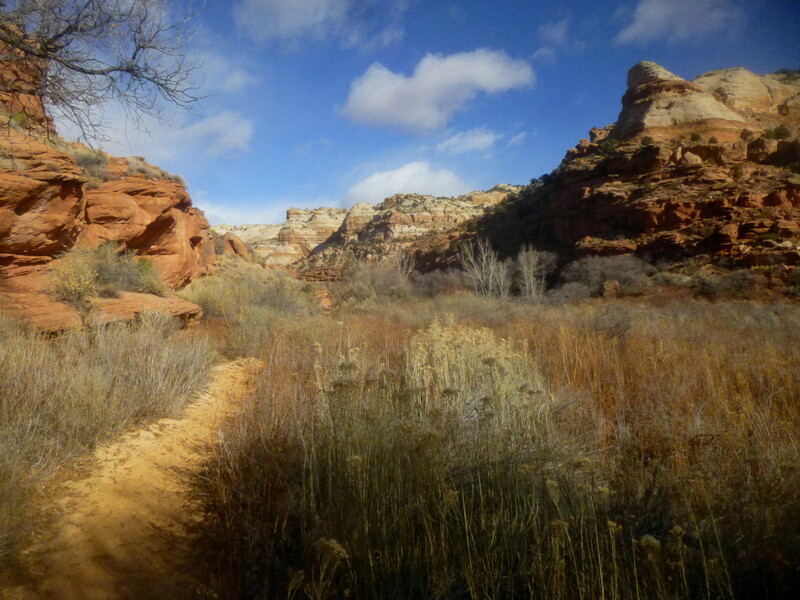 About 2 miles from the trailhead, the path cuts through a thick woodland section and finally meets up again with the banks of Calf Creek. If arriving in mid- to late-afternoon, this section is likely to be cloaked in shadows cast by the box elders, the high walls, and the waning sun. In some sections, the lush environment has given rise to groves of invasive green bamboo. 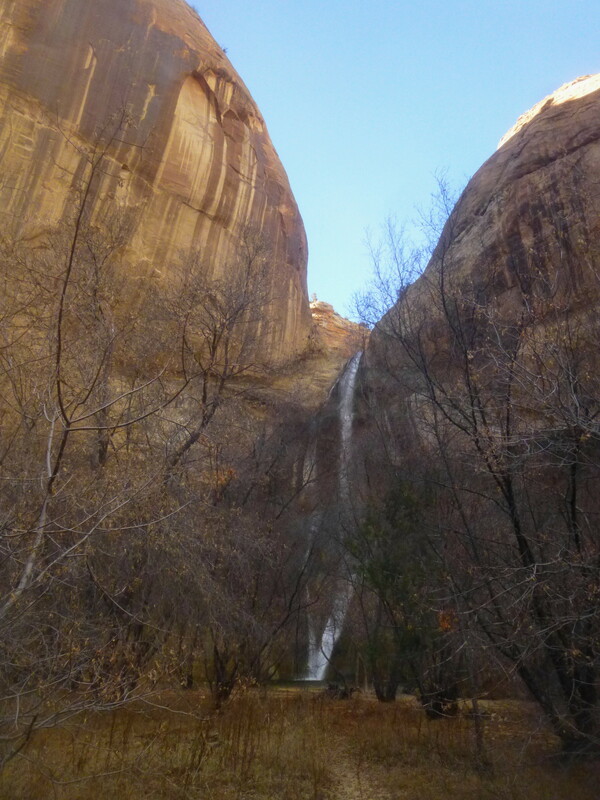 At last, with about 1/4 mile to go, you will begin to hear the rushing waters of Lower Calf Creek Falls ahead. Shortly thereafter, slices of the falls emerge through the thick trees. The trail ends at a beautiful, curved bowl with the misty cascade positioned front and center. The tumbling water splashes off the moss-covered walls into a blue-green pool, surrounded by a sandy beach. A grove of cottonwoods, box elders, birches, and Gambel oaks offers shade. The perennial water source has helped color the surrounding walls with a mix of reds and yellows, greens and blacks. A broad alcove on the left-hand side is lined with ferns and lichens. The only downside of this lovely destination, I’d imagine, would be crowds, which flock to the shady swimming hole in the hot summer. But on a brisk winter’s day in December, I had the place to myself (eventually a Boy Scouts’ troop arrived). With the sun having shifted position, the return trip can feel like a whole different hike. 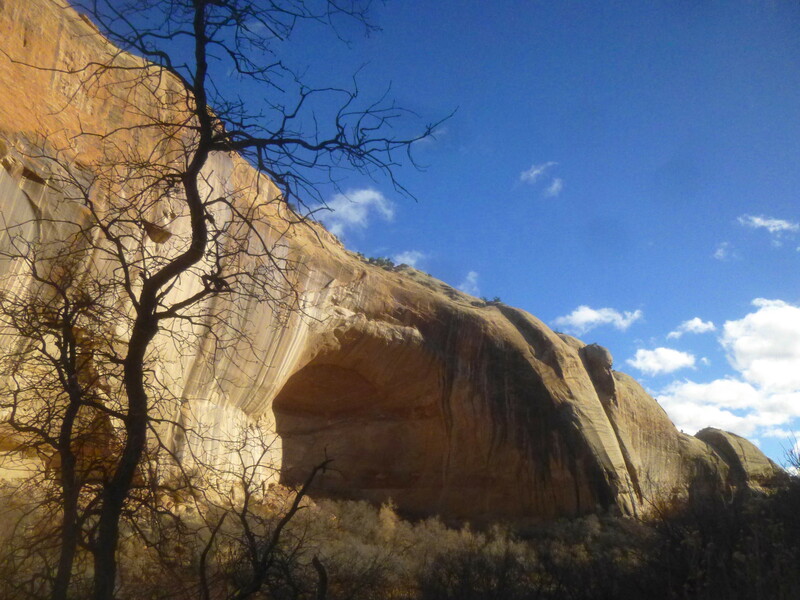 In the late afternoon, the west side of the canyon (where the trail runs) is mostly under shadows, but the east side is alight with a reddish-yellow hue. Notice the change in rock layers as you return to your car: the tan-brown Navajo sandstone turns to pink, red, and orange Kayenta. Nonetheless, most hikers will likely make better time heading back, having stopped for a slew of photos en route to the falls. Expect to spend 1 ½ to 2 ½ hours hiking from the campground to the falls, and allot maybe 1-2 for the return. Got a couple more hours to spare? 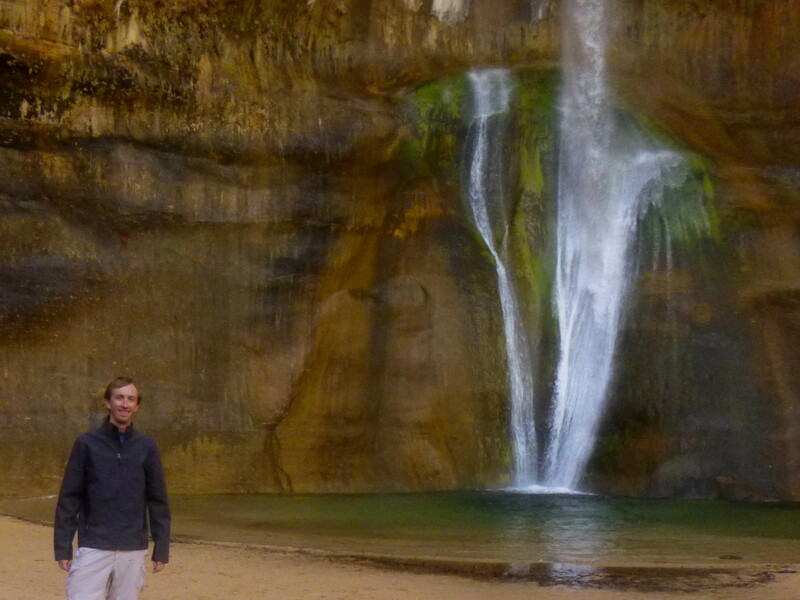 Try the 2-hour out-and-back to Upper Calf Creek Falls. See my recent route description here. 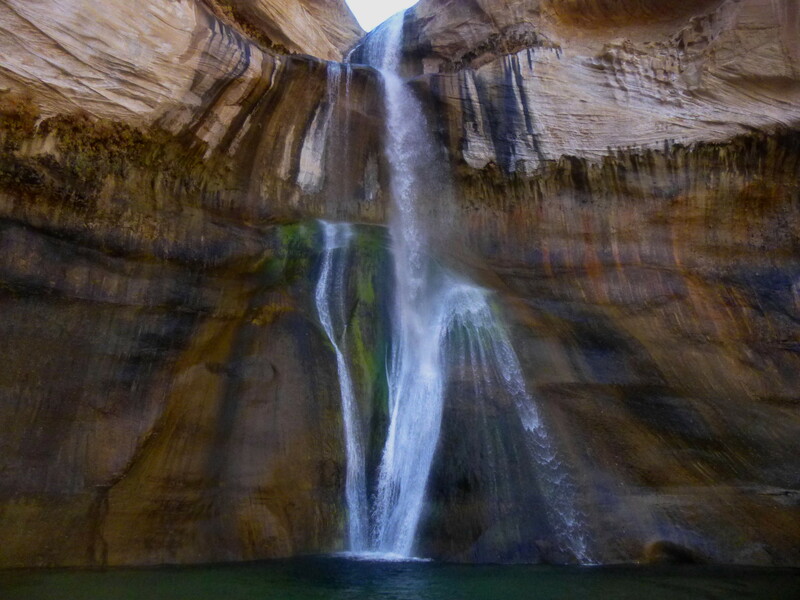 This entry was posted in Grand Staircase-Escalante National Monument, Moderate Hikes, Utah and tagged Calf Creek, Calf Creek Canyon, Calf Creek Falls, canyon, desert varnish, Escalante, Fremont Indians, Fremont pictographs, Grand Staircase-Escalante, Kayenta formation, Lower Calf Creek Falls, Navajo sandstone, pictographs, Utah, waterfall. Bookmark the permalink. I stopped here to camp and loved the waterfall hike in ’07. What a surprise.